[disclaimer: 4 years into studying Korean, I’m no longer a beginner. But I’ll try to review the site from the perspective of a new learner! Another brilliant creation from the Talktomeinkorean team! I’ve previously reviewed TTMIK HERE and HaruKorean is the perfect complement to the TTMIK site. 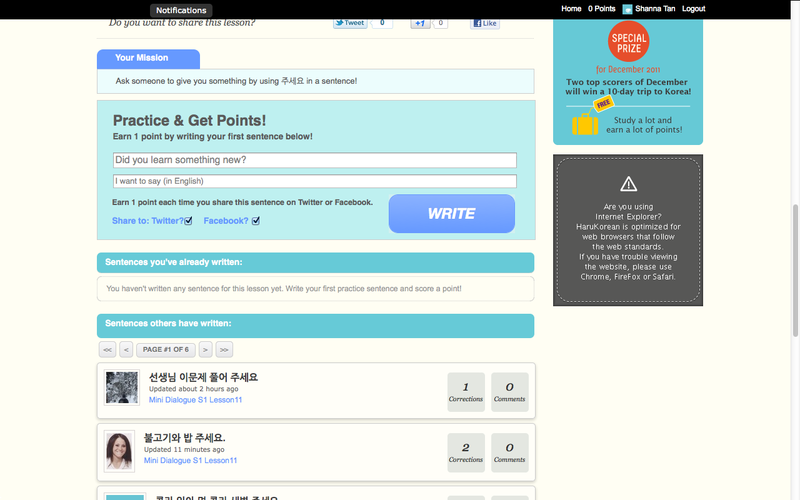 If TalktomeinKorean is an awesome site to learn Korean, HaruKorean is the perfect site to practice what you have learnt. The idea behind HaruKorean is simple, practice what you have learnt. The site integrates the lessons from TTMIK and the basic idea is: listen to the lesson, learn the grammar / vocabulary point and then use it to write a sentence. The best part of the site: native speakers to correct your grammar. The site claims that your sentence will get corrected with 24 hours and I tested it out. Wrote a sentence and I got feedback within 15 minutes! I wished HaruKorean was around when I first started Korean. That being said, HaruKorean is more suited for the beginners. The whole idea revolves around practicing what you have learnt specifically and it can be a little restricting at times. Also, you are only allowed to write one sentence at a time, and I think the problem that most learners face is expressing their own opinions (in a more elaborate way) and also stringing together more than a couple of sentences.